Samosa recipe with a stuffing of Aloo. 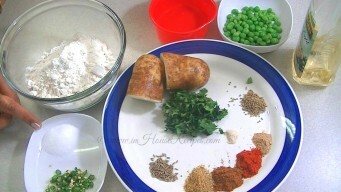 Step by step images and video in hindi starting with Samosa dough. Crisp fried Samosa has 300 calories punjabi style. Aloo Samosa Recipe Video in Hindi with English Subtitles. Samosa is one dish that is bound to bring water in your mouth. Recall the taste of the street Halwai's hot aloo samosas that we normally have with evening tea. You can't simply buy those moments and for everything else you have your master card!! Well, we cannot create the magic of Samosa time gossip at your backyard, but can certainly help you re-create the street side aloo samosa taste at home. We recently moved to USA and Samosa is what is missed the most. We have visited our relatives in New York and they and have treated ourselves with the fresh Aloo Samosas, made in Indian hub there called Edison (in New Jersey). They were not that perfect but were made fresh and they did spark a taste bud in the mouth, enough to motivate us for this home made recipe. We have also gone ahead with our experiments to enjoy the Maggi Samosa and Cheese Samosa. 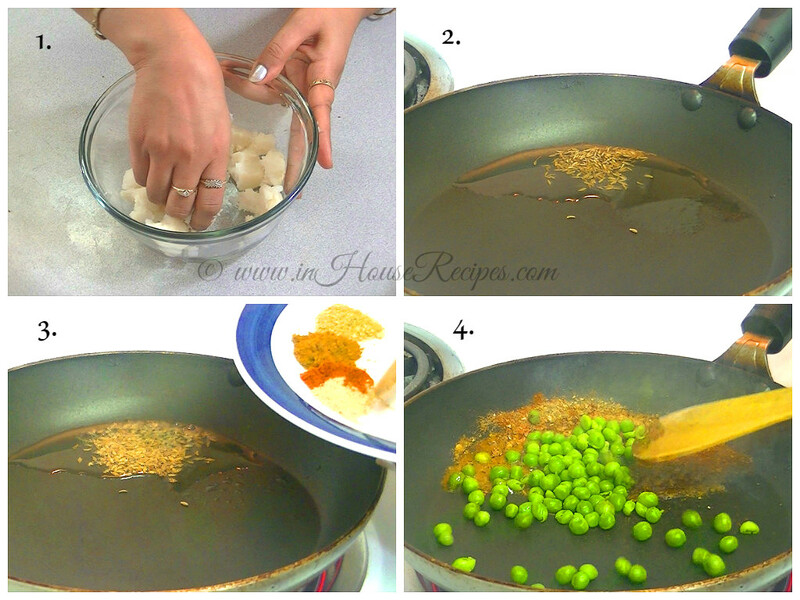 Here is a simple and easy recipe of punjabi style Aloo Samosa for your chirpy kitty parties. You should now get the ingredients ready. Note: We need warm water for making Dough. 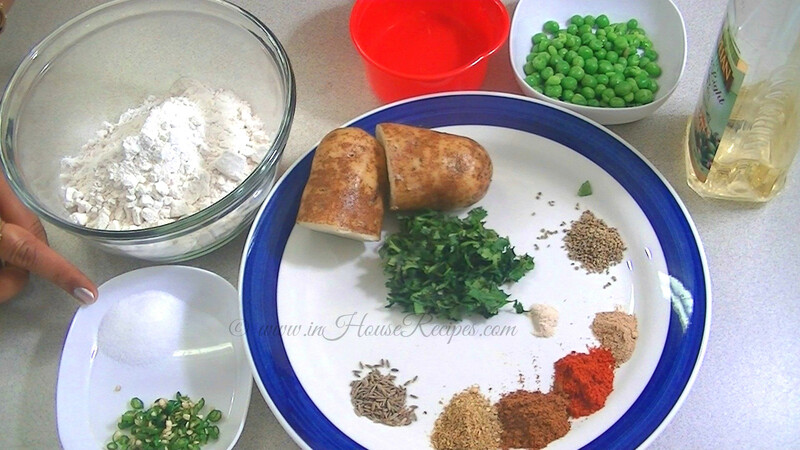 Take a bowl and add All-Purpose-Flour, Carom seeds, Salt 1/2 tsp and 3 Tbsp Oil. Mix it well. Do NOT add water yet. The idea is to mix Oil with flour first. 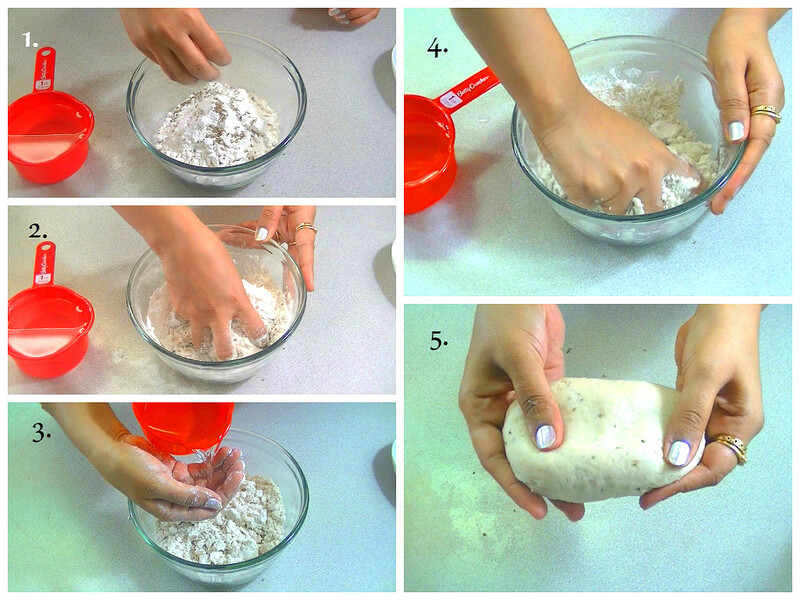 Once Oil and flour gel with each other, add small amount of water gradually and knead to make a dough. We would use approximately 1/4 cup of water in kneading this dough. Keep kneading the dough. No need to add more water. 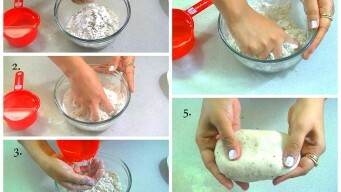 Just wet your palm with water, if you feel that dough is not sticking. We have spent approximately 5 minutes in kneading this dough and it is ready now. The dough is quite smooth and we cannot see any visible breaks in its consistency. This is the indication of its readiness. Cover it with a cotton cloth and keep aside. We will make the Potato filling for Samosa now. We need boiled Potato and have boiled it. If you have not, please boil them now before moving on to next step. 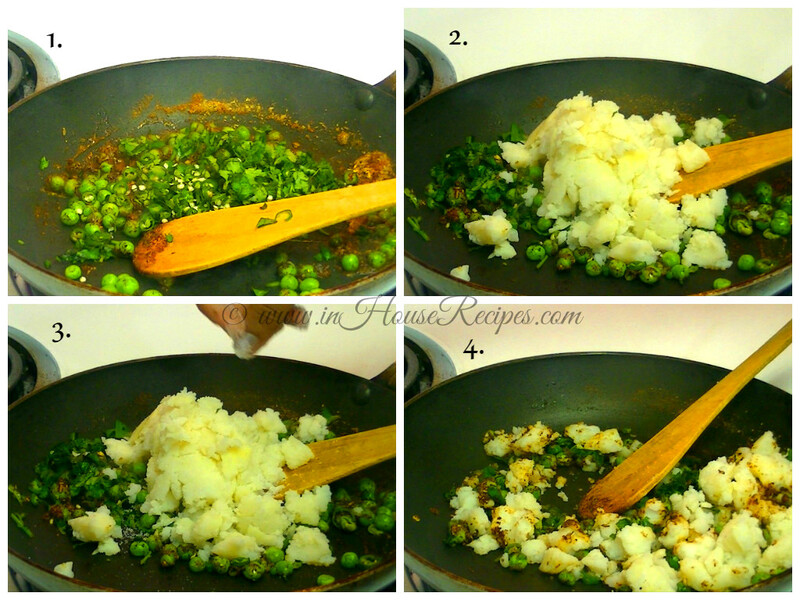 For Aloo mixture, we will use our hands to mash potato instead of knife. You can use knife too if you want. Peel Potato skin and mash them with your hand. Do not mash too much or too less. Some Potato pieces would taste good in Samosa. Now, take a pan and add 1/2 Tbsp of Oil. Heat it on high flame for 30 seconds. Once hot, add Cumin seeds and wait till they get golden brown in color. It would take approximately 30 seconds. Once done, Add Mango powder, Red Chili powder, Garam Masala, Coriander powder and Asafoetida. 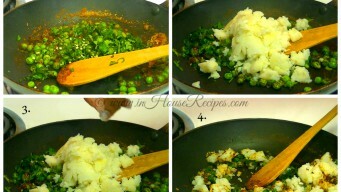 Stir spices and add Peas immediately. Turn stove on low flame. Add Coriander leaves and green Chili. Mix well. Add Potatoes and Salt 1/2 tsp. This would take another 1 minute and then switch Off the stove. Mix it well. Spicy Potato mixture is now ready. Keep it aside to cool down to room temperature about 5 minutes. The Samosa dough has already spent 7 minutes on shelf while we made and waited for Potato mixture to cool down. It needs about 25 minutes of sitting time for a crispy outer layer. So, 18 minutes is still left and you can watch TV. After 18 minutes, lets start making the Samosa with Potato mixture and dough. Take a small portion of dough about 1 inch in diameter and roll it into a circular flat-bread. Use a rolling pin. We can make 2 Samosas with 1 flat-bread. Hence, divide it into two portions with a knife. Now, we will use one semi-circle at a time. Keep the circular portion of the semi-circle facing your eye. Pick any one of the straight sides and fold it over. Dip your index finger in water and apply it on gently on this straight flipped corner. The idea is to make the other straight end stick to it using water, thereby giving it a conical shape. Place the other end on top of this to make two ends stick to each other. Press it lightly so make them stick together. Now, hold the cone in your palm with thumb and index finger. Fill the Potato mixture about 1.5 tsp. 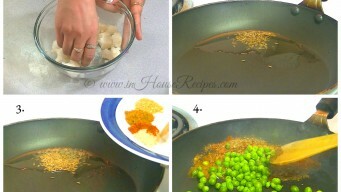 Do NOT add too much potato mixture as it might break the Samosa skin while frying. You have to once again dip your index finger in water and apply it gently on the circular cone’s edge. Close the cone and press it with your fingers to lock the mixture inside. Make sure that there is no opening in the cone's edge else the Potato might come out while frying. 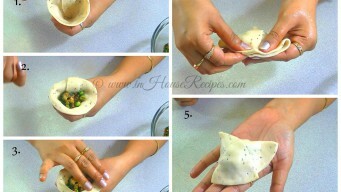 Now that you know the secret to getting Samosa's ready for frying, use it to get others ready too. Take a deep frying pan and fill it 75% with Oil. This amount of Oil is specifically required to avoid the red/brown patches on the Samosa skin. The red/brown patch comes up if the Samosa touches the base of frying pan while frying. Extra Oil makes sure that Samosa floats on its surface and does not touch the base. Another point to keep in mind is that we have to heat the Oil on high flame first. It would take about 5 minutes to reach the desired level of hotness. Once hot, turn the stove on medium. Samosa needs to be fried on medium flame only. If you fry it on high flame, they might get pimples on their skin!! 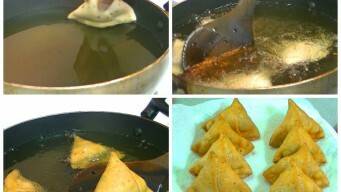 Add Samosas in the hot Oil on medium flame. You can add as many as your pan can hold at a time for frying. There is virtually no limit. I have seen the Halwai's fry 100's of them together in his huge Kadai! Let them fry on medium flame until they turn light golden brown in color. Initially, when you add them to frying pan, they would probably run down to bottom of pan. Don’t worry, once they are a bit cooked on the bottom side, they will start floating up in the Oil. Keep turning them upside down frequently to achieve even color on all sides. After 15-20 minutes of frying, the Samosas would turn light golden brown. Take them out of frying pan. Samosas are perfectly ready to serve hot! Samosa can survive a day without refrigeration in winters. During summers, you would have to refrigerate and can preserve up-to 2-3 days. You can re-heat the Samosa using Microwave but it would most certainly loose its crispness. 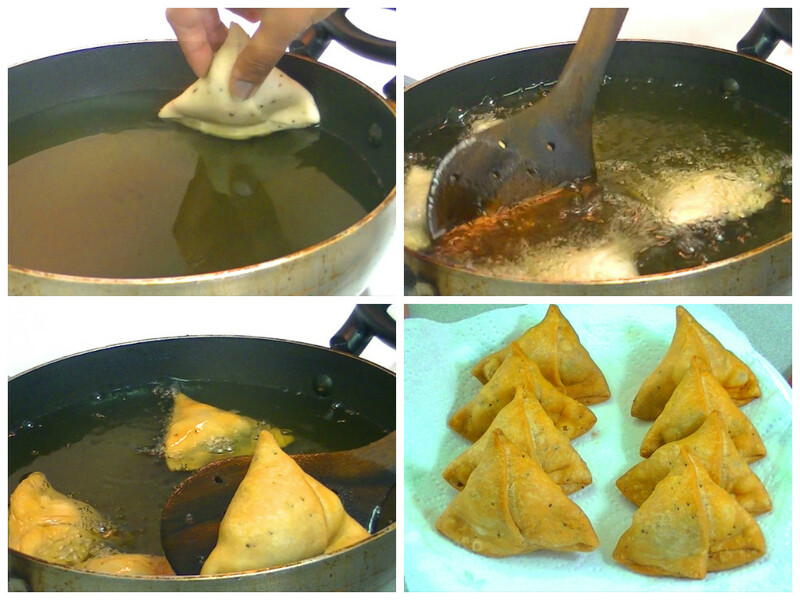 To regain the Samosa crispness after refrigeration, you can re-fry it mildly before serving. We do not recommend re-frying as it is un-healthy. Samosa chutney or sauce is nothing but Mango powder sauce (Amchoor Chutney). We have this recipe available separately and you can definitely try it. Some people including us like to mix Amchoor chutney with Coriander chutney to serve as Samosa sauce. The third option is the age old Tomato ketchup. It is the easiest option and I recall that Javed Jaffrey advertisement, dropping Hot and sweet tomato sauce on a piece of Samosa. Remember? Samosa Chaat is pretty famous here is USA desi Indian grocery shops. You would most certainly find Indians lined up to grab one after office hours.If you want to enjoy Samosa Chaat at home, you would need boiled Chickpea (white Kabuli chana), Amchoor chutney, Coriander chutney and a bit of Chat masala and whatever else you want to add. 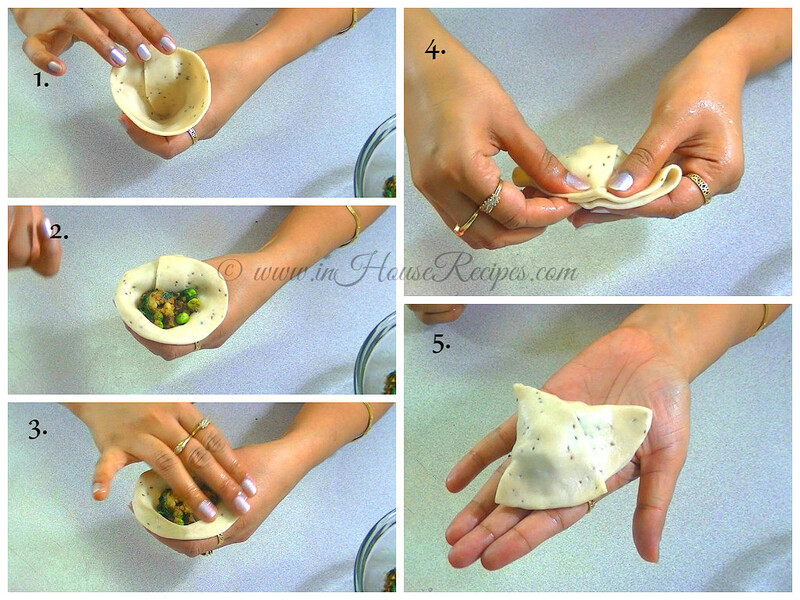 Take a bowl, add a Samosa and break open it into two pieces. Add boiled Chikpeas, the two chutneys and sprinkle chat masala. Your Samosa Chaat is ready to be served. Isn't that easy? Wow, Samosa can be such a universal dish! Yes, you can stuff a Samosa between two slices of bread. Add the chutney, add some raw Onion pieces and your desi style sandwich is ready to go. Enjoy! 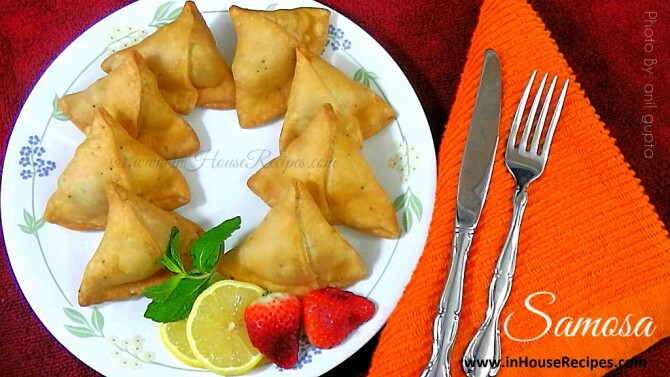 Do you have more ideas on how to serve a Samosa? Do share with us in the comments.